I spent ages looking for the right camera backpack. Searching through websites and forums, reading reviews and watching countless youtube videos! I was trying to find something that would fit my camera plus a lens or two, but also my lunch and a hoody or a coat, my GoPro and a tripod at the very least. If I’m going to spend a day walking its no good only having my photography equipment in my bag, I need to be able to carry other gear as well! I can’t rely on someone else coming with me, or worst… not having any food! It’s great how many different camera bags there are, but the majority seem to only cater for camera gear, with lots of little divider sections and tiny zip pockets for absolutely everything, from filters to flashes. I narrowed my choice down to the new Lowepro Whistler, which looks fantastic but comes with a very steep price tag, plus as it’s so new there’s no reviews or videos of it in use yet. 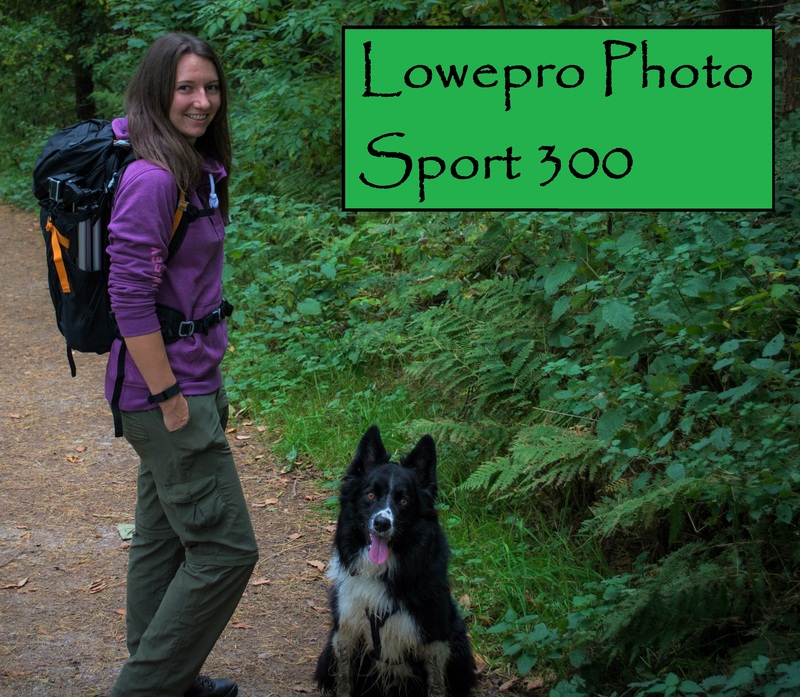 The other Lowepro that grabbed my attention was the Photo Sport. The 200 (20 litre) was really appealing, however I knew it wouldn’t fit my camera body with a 70-200 lens attached which is my most used lens. Then I spotted a review of the 30 litre on Dan Bailey’s Photo Blog where he mentions that he can fit his body with extra battery grip attached plus a 70-200 lens! After a bit of um-ing and ar-ing about whether 30 litres was too big or not, I went for it! After all my tiny work backpack is only 20 litres and its puny. I could easily carry 30l. When it arrived I was so impressed! It looks stunning and the build quality is top notch. The straps and material are tough and all of the clips lock home with a satisfying ‘click’ that makes you know they’ll hold fast. However my excitement was short lived… as I went to place my Nikon D7100 with the Nikon 70-200 f2.8 lens attached into the camera section I found out it wouldn’t fit! A good couple of inches were left sticking out. AHH! How disappointing! There are some differences in the style of the US Lowepro bag to the UK one, so perhaps the size is a little different, or maybe Dan Bailey’s body & lens is smaller than mine (I only noticed today that his 70-200 is the f4 version, which tend to be lighter and perhaps a little smaller?!) but for whatever reason, my camera and long lens would not fit. I contacted Lowepro and after a lot of thinking and looking around at other options I decided to keep this bag. I could fit my D7100 body with the kit lens attached and the 70-200 alongside it. Or as a better solution I can fit my D7100 with a lens cap on, the kit lens below it and the 70-200 alongside. Therefore I only need to pull out the body and lens and remove both caps and attach. This makes the process of bag to photo a little slower than intended, but really it doesn’t take that much extra time. So why did I choose this bag? As I said earlier I was looking for something for my outdoor gear as well as my camera kit. This bag meets the bill (mostly)! 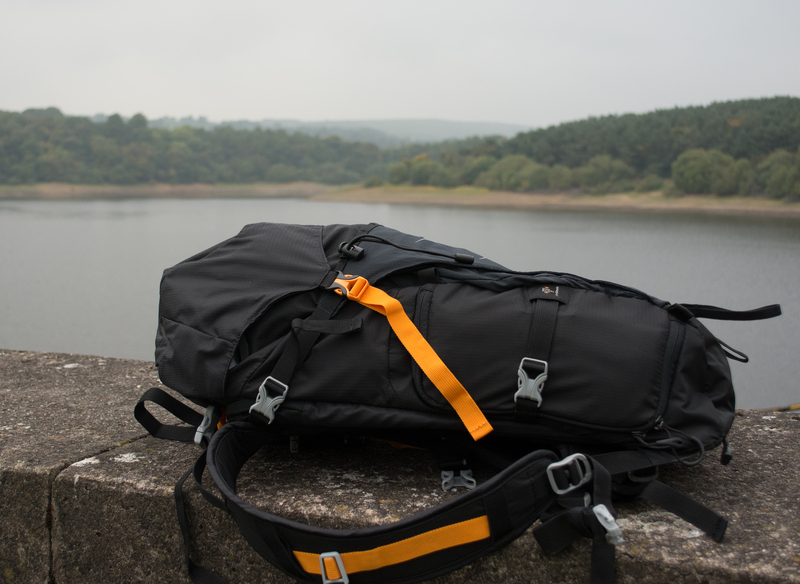 It’s basically split into two halves, the top half is a normal bag, with a wide drawstring opening that can be crammed full with a coat, waterproof trousers, lunch box, notepad, go pro accessories plus more. Then the bottom half, which is accessed through a side zip opening, holds your camera body and lens(es). There is a separate zip pocket down the back of the bag that is for a hydration pack (or could probably hold a small notebook/tablet instead) and then a spacious zip pocket on the lid which I use for my purse, keys, hat, gloves etc. On the other side of the bag (opposite to the camera section opening) is a pouch and clip for holding your tripod. I can fit my bog standard tripod plus my GoPro on the GoPole in here and they were held securely for a 3 hour walk. To put the cherry on the cake it has an all weather cover in silver! Hurrah. So when the heavens open you can whip your waterproofs from the top section and keep yourself dry as well as covering the bag up, keeping everything safe. However one of the differences on the model I have, unlike the ones I’ve seen in American videos, is that the camera compartment does not remove, it’s sewn into the bag. On the American ones the camera holder is its own unit which can be removed, leaving you with a completely normal backpack. As this is a good size bag that’s comfy to carry it would have been useful to have the option of using it as just a backpack, but if I had never seen the American bag with that feature I still would have bought this bag, so I haven’t really lost anything there. What’s it like to carry? This bag is so comfy! The straps are nicely padded, especially the waistband which also has two small zip pouches on it. I hate bags with a thin waist straps which is one of the reasons I was so attracted to this bag. It sits snuggly against my back and has been comfortable to carry fully loaded for several hours. There are lots of different adjustment points so you can get it just right for you, especially as the chest strap can be moved up and down. Being a woman this is crucial as we all have different shaped lady parts on our chest, so the more that can be moved the better! 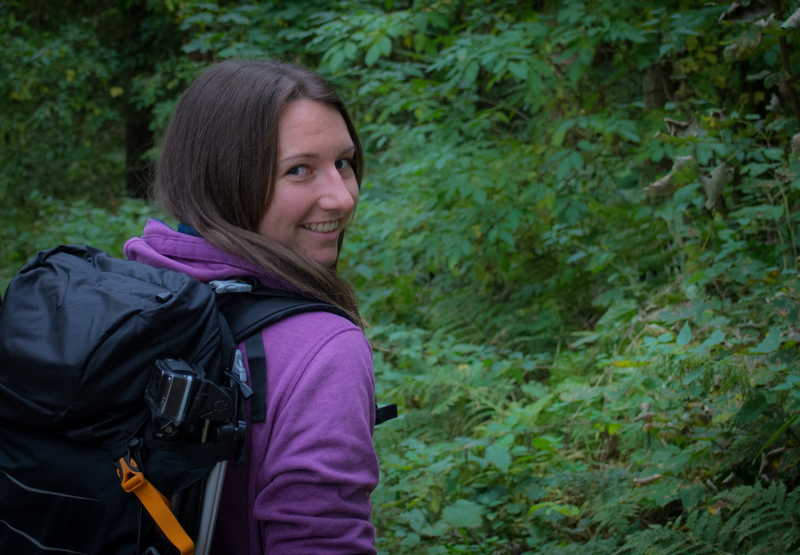 I did get a bit of a sweaty back and waist after a particularly steep uphill walk, but even the best bags probably wouldn’t keep me from sweating, so that’s hardly to be unexpected. Although I’m still slightly gutted it doesn’t fit my body + long lens attached, it has been perfect for my use so far. It would be a bit of a faff constantly putting the camera in and out of the bag (which I think it would be with any bag, no matter what the design) so I’ve found I prefer to get to the spot I want to take photographs at and then keep my camera out until I’ve finished using it. Or I carry my camera around my neck or in my hand while I’m walking when I want to have it out for quick use. The bag is pricey, as I’ve come to find most camera bags are, but hopefully it will stand the test of time and be worth it! The padding inside is really thick and cushioning and I feel happy that my camera gear is safe and protected while I’m walking along and then putting my bag down on the floor. It’s going to be my go to bag for all trips, be it a visit to a new city or a day at the beach. Ruth- Thanks for the link love. I’m glad you like your new Photo Sport camera pack. Lowepro did a lot of things right with that series. Regarding my previous review of the Photo Sport 30L, that was an older model. It does indeed fit the camera with a 70-200 lens f/2.8 lens attached, but alas, the 30L model I have was short lived. The new PS 300 looks like a great pack, and while the camera compartment is apparently a little bit smaller, overall it seems to be more streamlined and it looks like it has a much better suspension system. Also, my 30L is pretty bulky if you don’t fill it up. While it makes a great backcountry ski pack, I almost never use it in the summertime, so I’m kind of in the same boat you are. I still haven’t found an ideal summer camera pack that fits my big lens, that offers quick access and that has a spacious upper compartment for jackets, food, water, etc… That said, the Photo Sport series comes about as close as I can find. Enjoy your new pack and have fun with the camera! Ah that makes a lot of sense about the older series. 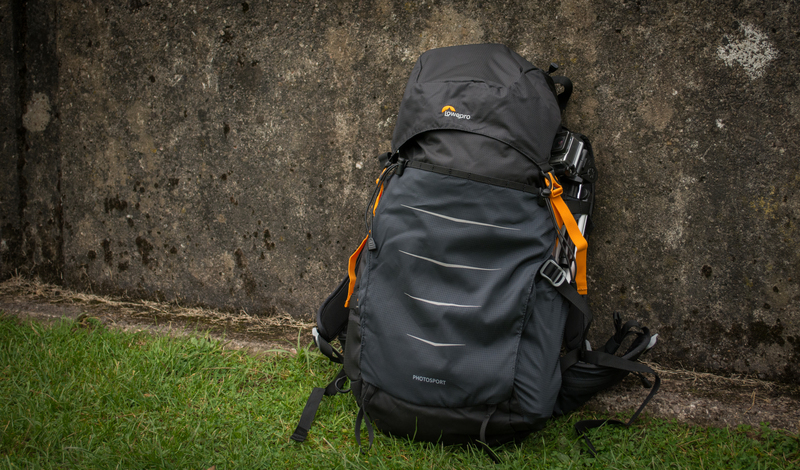 I agree I think this is the best pack for my circumstances, it is a really good bag overall. You’ll have to let me know if you ever find the perfect summer pack! Sounds like you are looking for exactly what I am. Thanks for dropping a comment here. I just put it on the kitchen scales to find out for you, its 500g. I don’t even notice its there so I guess that answers the question, it seems to balance well, although I sometimes have to adjust my straps quite a lot to get the most comfortable position. Many thanks. Hmm I really don’t know sorry. Like I said I don’t notice my tripod but 1.4kg is much heavier, but the bag is designed really well with the tripod mount. I guess the best thing you could do is see if you can try one out?